Monkey Vs Robot is a Nintendo-style platformer. If you've played Super Mario World 1, 2, or 3, then you get the idea. The main focus of this project is exploration, and alternate solutions to problems. In each level, there will be a straight-forward route with some puzzles and obstacles, and there will also be one or more alternate routes or "shortcut rooms" that allow the character to bypass areas, or lead the way to a hidden powerup. The environment will be as ridiculous as an italian plumber fighting bird-headed turtles. Though the title is Monkey vs Robot, that will not be the limitation. The aim is to be stupid, ridiculous, and kind of satirical. Input on the environment will be welcome from all contributors, all far-fetched and wacky ideas will be put into the pot. 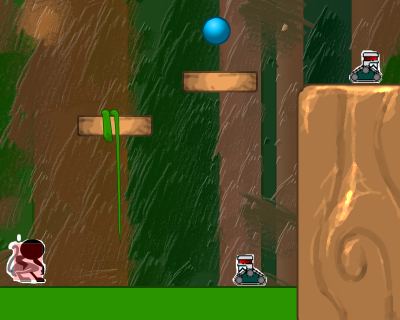 The first level will be in the jungle, but that is just to familiarize and set the stage. Ideas for other levels are: subway cars, spaceship, old-west saloon, the sea floor, and of course an ice level. As there is a focus on vertical climbing, nearly all levels will need to facilitate this in some manner (vines, wires, poles, etc). For enemies, I was thinking robots of various varieties, japanese school girls, toilet bowls, zombies, etc. For a story, there should be either simply no story, or simple cutscene animations without text. This means no in-game internationalization. If we get this far, I envision the story being very non linear and ridiculous. For example, instead of motivation like saving a princess, the monkey would see a toilet bowl eating a piece of feces and get really mad; there would be close up of the monkey's angry eyes turning red, and the level would begin. All the controls required will be directions and two buttons ("A" button jumps, "B" button does various actions depending on context). There will be a bit more focus on vertical climbing than seen in most platform games, and there will be a climbing attack whereby the monkey slides down really fast, and damages anything it hits below it. Throughout each level, there will be challenges in the form of enemies, obstacles, and puzzles. An enemy is something that actively moves around and tries to damage or push the monkey, an obstacle is something the monkey has to get over/under/through to progress, and a puzzle is an obstacle that requires either good timing, or an item from somewhere else. From here on in, i'm breaking it into stages. 3 jungle levels completed, roughly 15 minutes of gameplay necessary to finish the game. There will be no bananas in this game. Ever. The monkey has basically two stats, hit points (a max of 3), and jumping strength. There will be different power-ups that affect these stats. The monkey will be able to hold certain items with it's tail. The item is thrown when button "B" is pressed. Items can have multiple uses, like killing enemies and solving puzzles. The main character will be a squirrel monkey. 10 different kinds of enemies, including 2 multi-hit bosses. 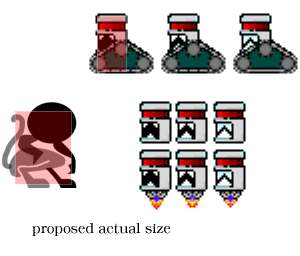 The computer AI will involve knowing what direction the monkey is from the evil sprite (x and y), and either moving in that direction, firing a weapon, or doing nothing. The player will have the choice of 3 monkeys at the beginning of the level, each one has certain advantages/disadvantages. I'm thinking a mandrill that's tough, and a spider monkey that can jump higher. Gameplay-wise, this game is not innovative. I think this will help the project, as we won't need to spend as much time on communication as we will all have an intuition about how things should work.